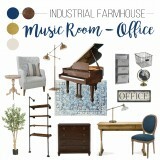 If you missed last week’s post, I’m making over our music room as part of the One Room Challenge! 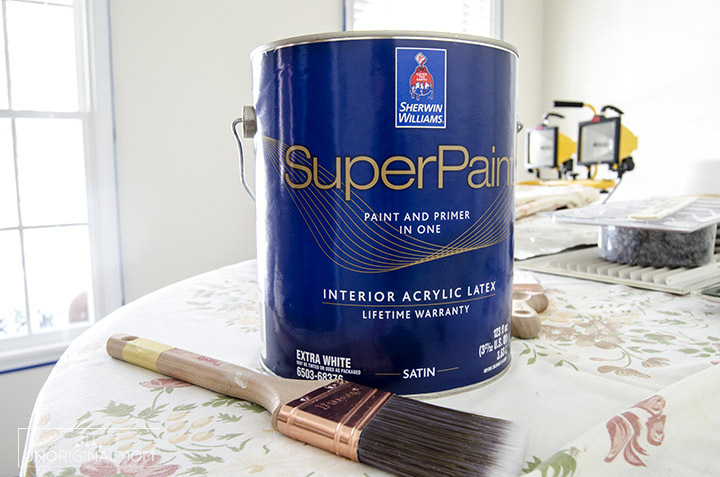 Make sure you head over there first to get the full run-down on the challenge, see all the “before” pictures and design board, and hear all about my plans for this space! 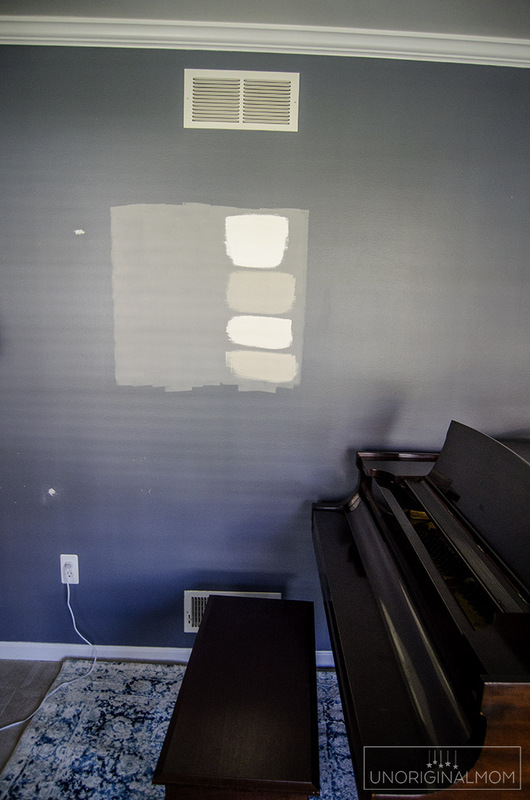 Hubby recruited some neighbors to help us move the piano into the middle of the room, and we started painting away. 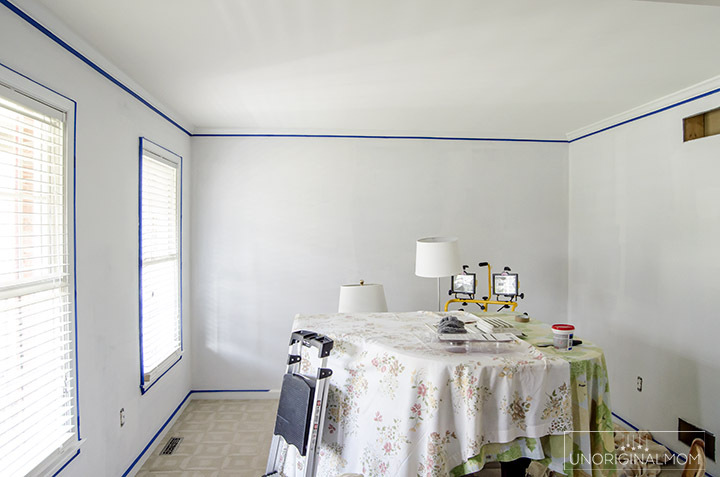 Here’s what the room looked like after 1 coat of primer – so much of a change already! 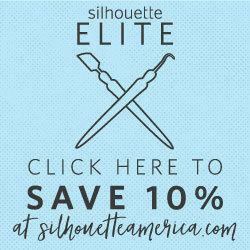 Ahhh….so much better, don’t you think? 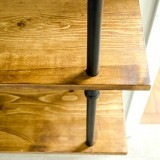 Shoji White is a creamy, warm, soft white with greige undertones. 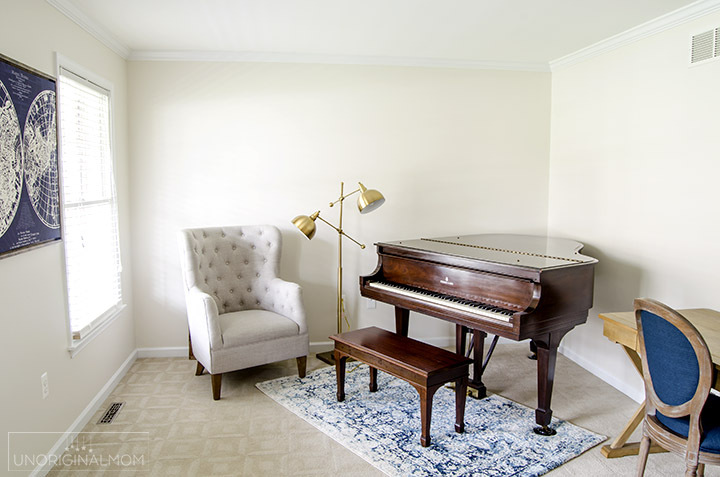 It was the perfect color to let the beautiful dark wood of the piano take center stage while also pulling in the cream color from the rug. 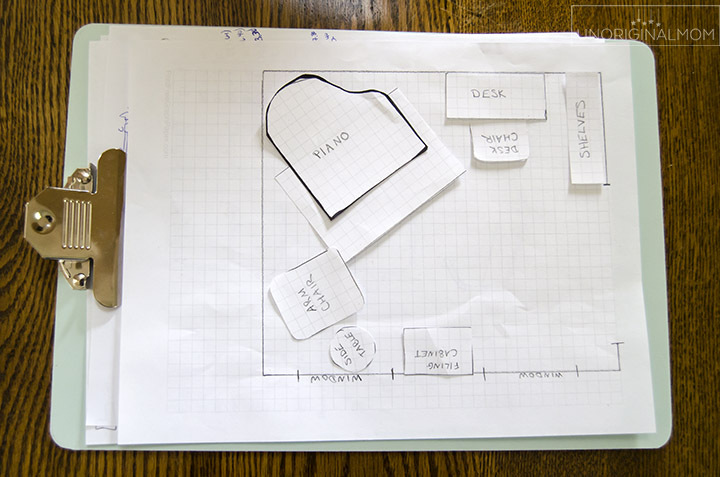 But before I let you see the “after” picture (I know, I’m such a tease), I want to talk a little bit about my plan for the room layout. During the planning stages of this room makeover, I spent a little bit of time (okay, a LOT of time) working on a new layout for our room. The biggest challenge, of course, is that beautiful 1938 Steinway baby grand piano. 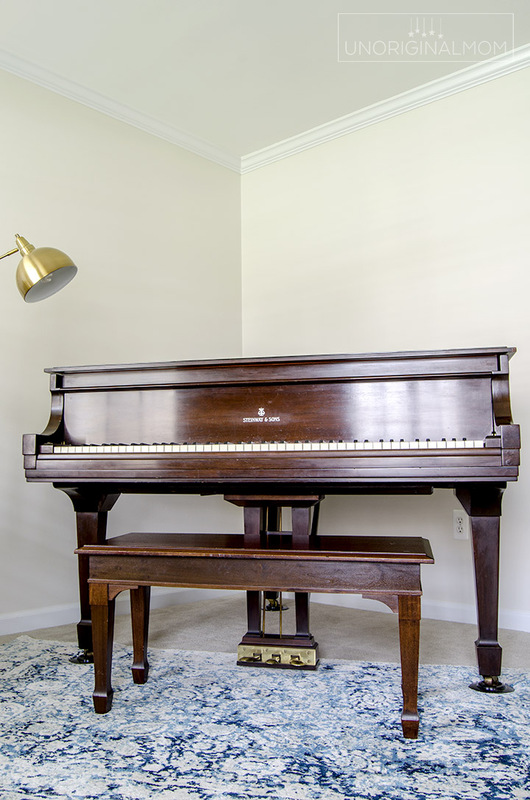 It’s not like I can just try a bunch of different furniture arrangements until I find something that works, seeing as how it takes 3 grown men to even slide the piano a few inches. So I went old school and worked out my furniture placement with graph paper! Each square of graph paper equals 10 inches, so I was able to use the dimensions of the furniture I was considering to play around with different arrangements. I knew I wanted a little reading nook by the window, which meant the opposite corner of the room would become our office area. Ultimately, this is what I decided on! If you aren’t familiar with grand pianos, the lid is hinged on the left side (as you’re sitting at the piano). We don’t put the lid on a stick very often, but we definitely wanted to have that option, so putting the right side against a wall wasn’t a possibility. So really, keeping it where it was or putting it in the far corner of the room away from the doorway and the windows were our only choices. 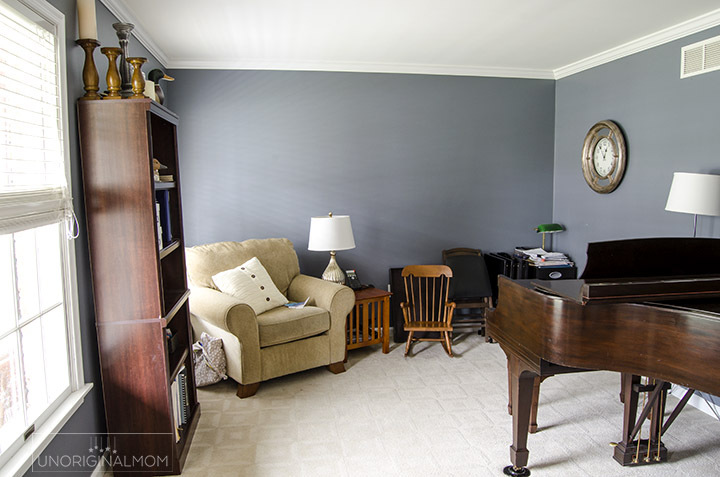 I was able to save a little bit of space and make the piano the true focus of the room by angling it into the corner rather than having it flush against the wall. 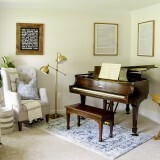 When we moved the piano into that spot, it’s like the entire room burst into song – that’s where it was meant to be! 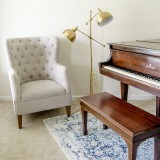 And how perfect is the paint color with the rug and the piano? So you can see from the photo that I’ve already got some of our new furniture pieces in place (more details on those later), including our AMAZING new lamp from Lamps Plus! Isn’t it fabulous? There is still lots to do in here…some kind of storage piece to go between the windows, window treatments, pipe shelving, and of course lots of wall decor. 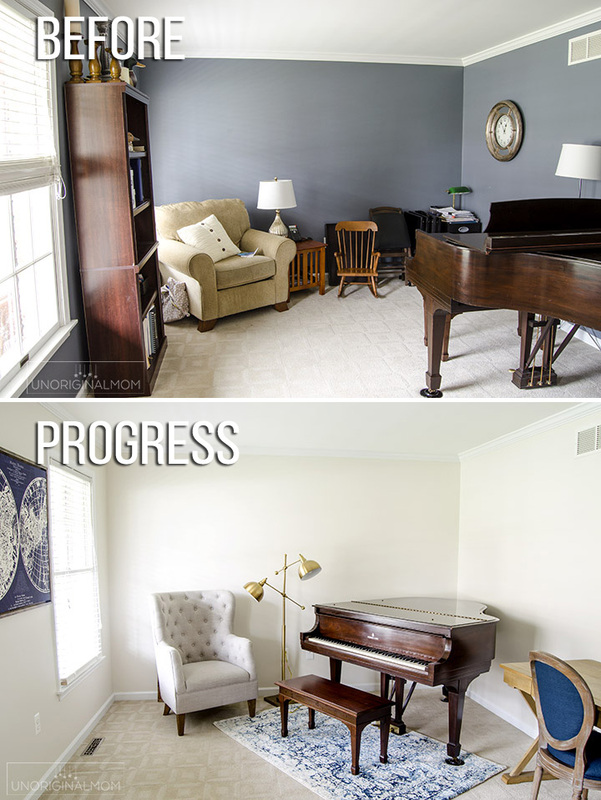 But I still can’t believe the transformation of this room with just a coat of paint and a new layout! 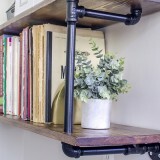 The next step in this makeover is the DIY wall mounted industrial pipe shelving…I’ll be sharing all about that next week, so be sure to subscribe so you don’t miss the update! I can’t wait! 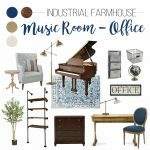 UPDATE – browse all of my Music Room/Office Makeover posts here! If you’d like to see some more home decor inspiration, pop over to see the progress of all the other bloggers in Week 2 of the One Room Challenge. It’s looking so great! 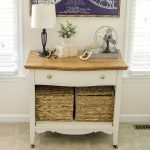 Found you through the One Room Challenge link up! I’m in love with this room already. 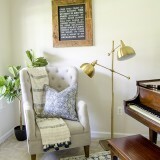 That bright white paint is perfect and I’m swooning over that gold double lamp. Can’t wait to see more of this space. As a pianist, shouldn’t the piano face the room? 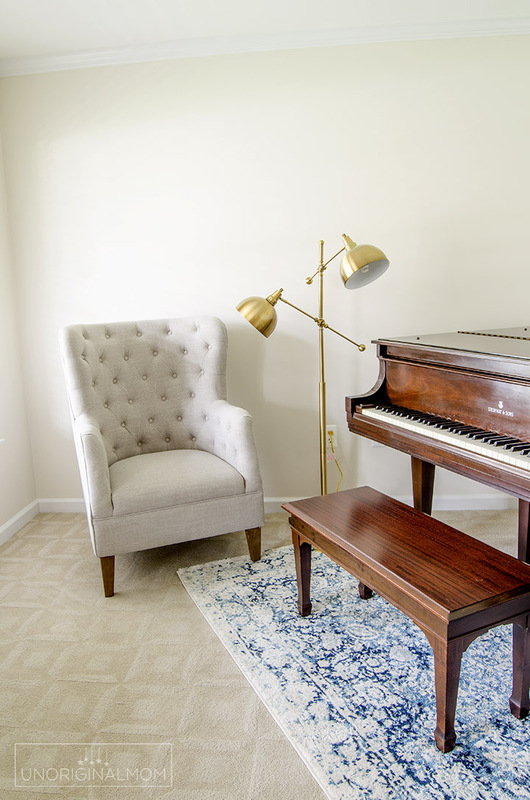 If I was a true pianist, I might be more concerned about that ;-) It’s a family piano and it’s more important for me to be able to sit down at the piano easily with my daughter, and visually I love how it’s so inviting to come sit down and play! It’s the best use of space for our room too, since it also has to double as an office. But if I were using the room to give voice lessons or something like that, you’re right, I’d probably turn it the other way. 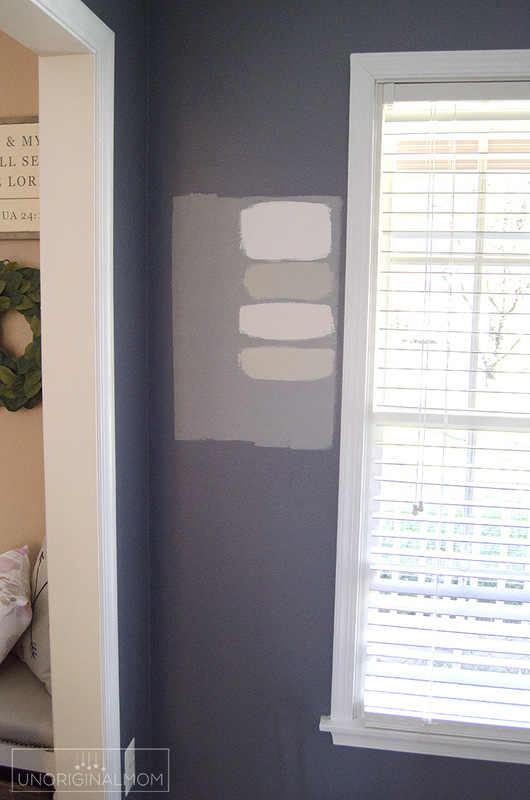 We want to use Shoji White on our walls, but want there to be some constrast with the trim color. Yours looks good! 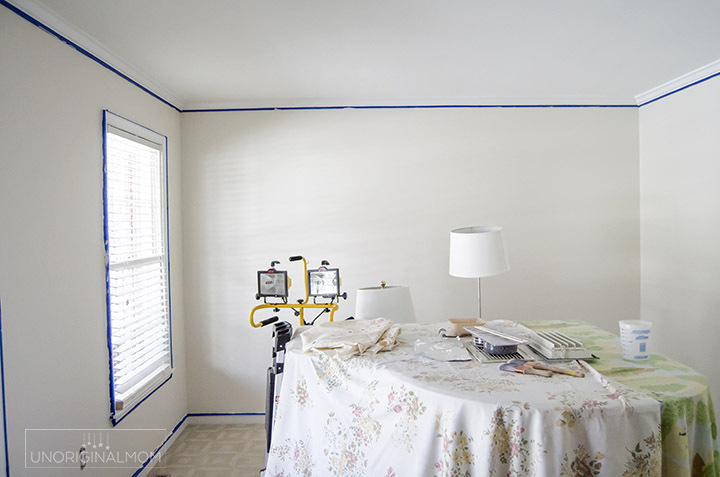 What trim color did you use with your Shoji White walls? Hi Ann, I honestly don’t know the exact shade of our trim (they were like this when we moved in) but it’s a pretty typical clean white trim color, nothing out of the ordinary. Shoji is such a creamy white/light beige (even more so in person than it looks in these photos) that I think any shade of white trim will pop against it. But I am a big fan of paint samples, so I’d recommend testing out a spot next to your trim before you commit to make sure you like it!